1675 ~ 1701: born in Kyôto in the district of Miyagawa-chô. His father Bicchûya Rokuroemon is a renowned dance teacher in the Imperial Capital and his adopted brother Sawamura Kodenji I is a promising wakaonnagata actor. He receives the name of Sawamura Rokunosuke and becomes a reputed musician (drums). 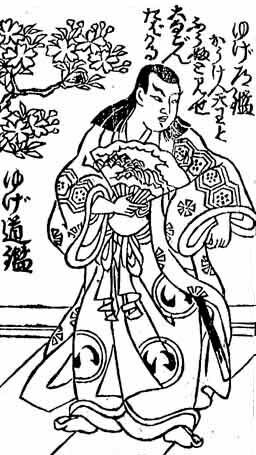 1st lunar month of 1701: Sawamura Rokunosuke decides to shift to acting and takes the name of Sawamura Chôjûrô I. He makes his first appearance on stage at Ebisuya Kichirôbê's theater, playing the role of Yamagata Oribe in the drama "Shin Yome Kagami", which is produced by Yamashita Hanzaemon I. 11th lunar month of 1701 ~ 10th lunar month of 1703: Chôjûrô settles in Ôsaka and plays in the productions of Kataoka Nizaemon I, notably the drama "Ransetsu Oredake", which is performed in the 1st lunar month of 1702 to commemorate the memory of Arashi San'emon II. 11th lunar month of 1703 ~ 10th lunar month of 1712: Chôjûrô returns to Kyôto and plays in Kameya Kumenojô's and Ebisuya Kichirôbê's theaters. 11th lunar month of 1709: Chôjûrô plays the role of Fujiya Izaemon, the most important role of the great Genroku actor Sakata Tôjûrô I who passed away a few days before the performance. This is a great challenge for Chôjûrô, who spends all his time and energy perfecting his acting skills in order to please Tôjûrô's fans. His partner in the role of the courtesan Yûgiri, Izaemon's lover, is Yoshizawa Ayame I. The performance is successful and contributes a lot to the fame of Chôjûrô. 7th lunar month of 1711: Chôjûrô plays the role of Asama Tomoenojô in the drama "Keisei Asama-ga-Dake", which is performed in the same theater. His stage partners are Yoshizawa Ayame I (the courtesan Miura) and Yamashita Kyôemon I (Wadaemon). The role of Tomoenojô was played for the first time by the Edo actor Nakamura Shichisaburô I in the 1st lunar month of 1698 and became one of the most famous wagoto roles. The performance is a big success and is extended up to october 1711. 11th lunar month of 1712: second stay in Ôsaka. Chôjûrô plays the role of Inarinosuke in the drama "Inari Daimyô Shintaku no Kawado", which is produced by Mitsuyama Shichisaburô. 11th lunar month of 1713: Chôjûrô achieves a great success by playing the role of Naniwanojô in the drama "Ôminato Kogane no Izumi", which is produced by Yamamoto Hikogorô. Summer 1715: Chôjûrô becomes zamoto. 1st lunar month of 1716: Chôjûrô produces in Ôsaka the drama "Ôkazari Monomi Guruma", starring the great wakaonnagata actor Ogino Yaegiri I in the role of Ono no Komachi. 1716: Chôjûrô gives to his young disciple Someyama Kijûrô the name of Sawamura Zengorô. 11th lunar month of 1716: Sawamura Chôjûrô takes the name of Sawamura Sôjûrô and produces in Ôsaka the kaomise drama "Kogane no Ichigura" in which he plays with Sawamura Zengorô and Anegawa Shinshirô I. He holds his new name only during this performance. 2nd lunar month of 1717: Chôjûrô produces in Ôsaka the plays "Keisei Chibiki no Ishi" and Chikamatsu Monzaemon's "Keisei Kokusen'ya" in which Sawamura Zengorô is well received by the public, notably for his performance in the second play in which he has to replace the star Anegawa Shinshirô I for the main role of Watônai. 11th lunar month of 1717: Chôjûrô produces in Ôsaka at the Naka no Shibai the kaomise drama "Inari Yashiki Daikoku Bashira" in which he plays the role of Inamatsu Genjûrô; his stage partner for the role of Oshige, Genjûrô's spouse, is the young wakaonnagata Sanogawa Mangiku. 12th lunar month of 1717: Chôjûrô produces in the same theater the kiri kyôgen "Ôsaka Shinjû Hajimari" , in which he plays the role of Masuya Kanbê. 12th lunar month of 1719: Chôjûrô produces in Kyôto Adachi Saburôzaemon's kaomise drama "Yamato Ôji Meoto Izumi", starring Ogino Yaegiri in the role of Oshige. 11th lunar month of 1722: Chôjûrô plays the role of Takamatsu Gennai in the drama "Hotei Odori", which is produced in Ôsaka by Takeshima Kôzaemon II. 11th lunar month of 1724: Chôjûrô plays the role of Tamamatsu Inabanosuke in the drama "Senbon Matsu Hi-no-De no Maizuru", which is produced in Ôsaka by Sakakiyama Shirotarô I and Sawamura Kiyojûrô. 11th lunar month of 1730: Chôjûrô plays in Kyôto the role of Umematsu Takaemon in Sawamura Bunji's kaomise drama "Inari Yakata Manpô no Kura", which is produced by Arashi Koroku I at Hayagumo Chôdayû's theater. 9th lunar month of 1732: first Kabuki adaptation of Matsuda Bunkôdô and Hasegawa Senshi puppet theater drama "Dan no Ura Kabuto Gunki", which is produced in Kyôto by Sakakiyama Shirotarô I at Miyako Mandayû's theater; Chôjûrô plays the role of Shigetada [casting]. 12th lunar month of 1733: Chôjûrô appears on stage for the last time, in Kyôto, playing the role of Kanki in Chikamatsu Monzaemon's masterpiece "Kokusen'ya Gassen", which is produced by Anegawa Chiyosaburô I.
Sawamura Chôjûrô I was an outstanding actor, without doubt the most representative tachiyaku for the Shôtoku and Kyôhô eras, and a successful zamoto. He spent all his career in the the Kamigata area and there is no record of any stay in Edo. Sawamura Chôjûrô I was the founder of the Sawamura clan, whose main line, the Sawamura Sôjûrô line, is famous for his Edo wagoto style, which takes its roots in Chôjûrô's acting.